You can also access via our iOS or Android APP. If you reach the “Tipster PRO” status in one (or more) sports you will gain 1/2 of the revenue you generate via subscriptions. Nowadays you can tip on Football, Tennis, Basketball, Handball, Baseball, Hockey, Volleyball, Rugby, Cycling, American Football, Snooker, Mixed Martial Arts, E-Sports, Australian Football and Darts. The PRO status is applicable to every sport. If you have a track record of more tan 1,000 picks and a >5% yield we can import your statistics so that you can be a Tipster PRO at Pyckio. or another one with a 15% yield in 400 picks? 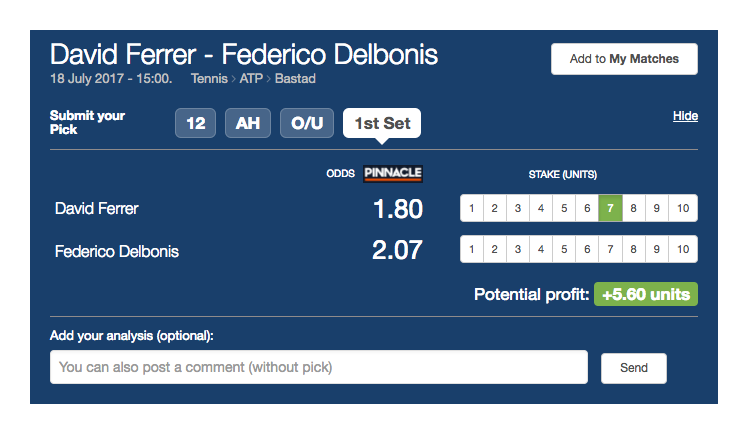 In order to compare Tipsters we have developed an algorithm that provides a Rating (between 0 and 5) to every Tipster. You will be able to have your public Tipster personal page, where you can see your charts and statistics. 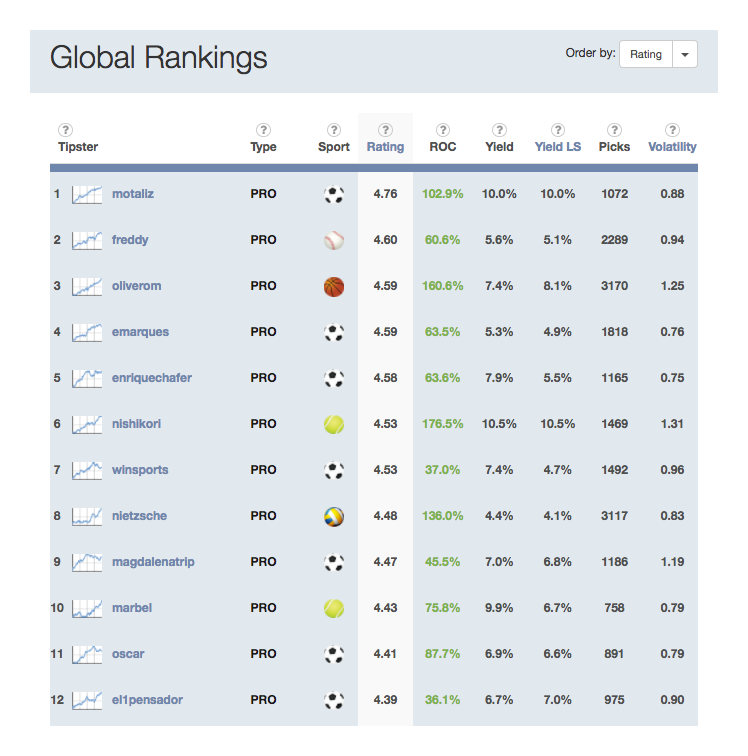 If you are a Tipster and you already have a blog or website you can also submit your picks in Pyckio. However, only your Pyckio picks are computed. We don’t maintain the betting records you can have in other sites, with the exception of the point above. Submit your picks and add your analysis (optional). Picks are solved automatically, what guarantees that Tipsters’ statistics are truthfull. 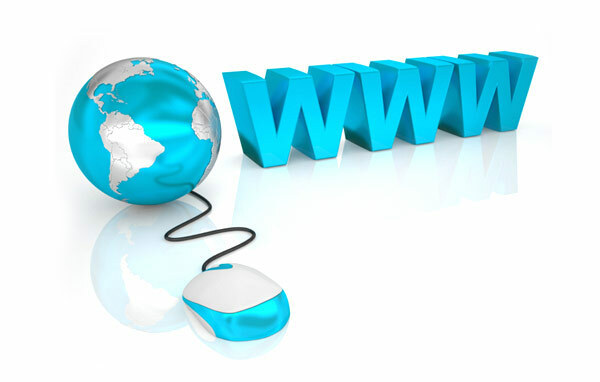 Therefore, Tipsters don’t have to solve their picks manually. We use real time (or with some seconds delay) Pinnacle Sports odds. We organize regular Tipping contests where we hand out many monetary prizes for the best tipsters. These “contest” picks are different from the standard picks and do not compute for your general statistics as a Tipster. You’ll be able to see which are our best Tipsters on every sport, PRO but also FREE, in our Rankings page. Our Tipsters PRO have proved their expertise to provide long term winning tips. 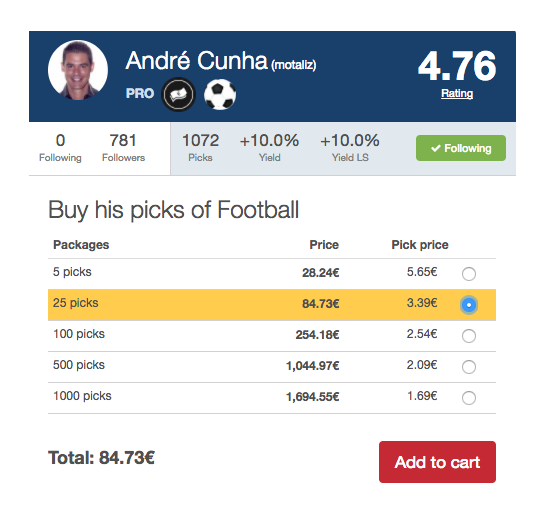 Picks are sold in packages (via credit/debit card, Skrill or Paypal) and the price depends on both the Tipster Rating and the package size. 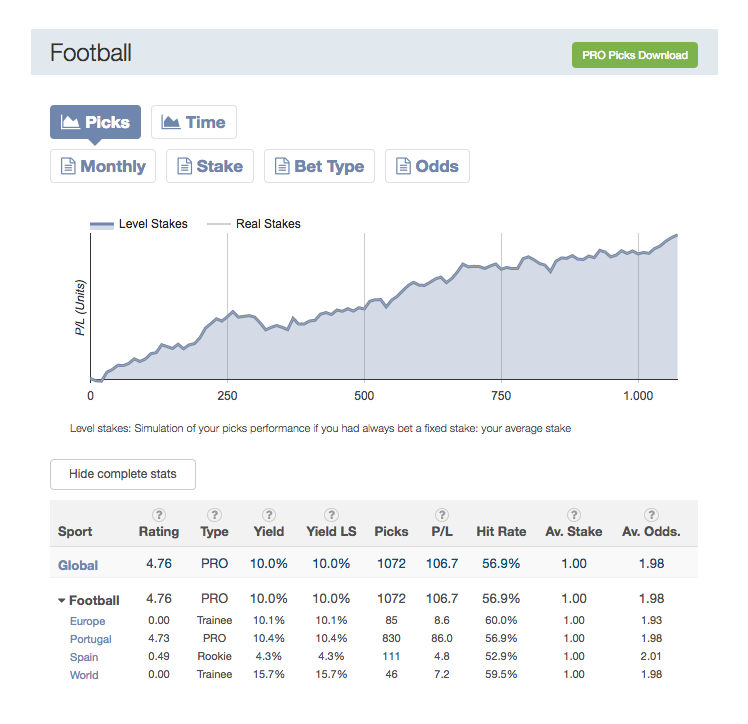 Moreover, you can change your Tipster PRO if you aren’t satisfied with his results. You can use our simulator to estimate your potential winnings. Our GrandMaster Tipsters are in a second skill level, behind the PROs. 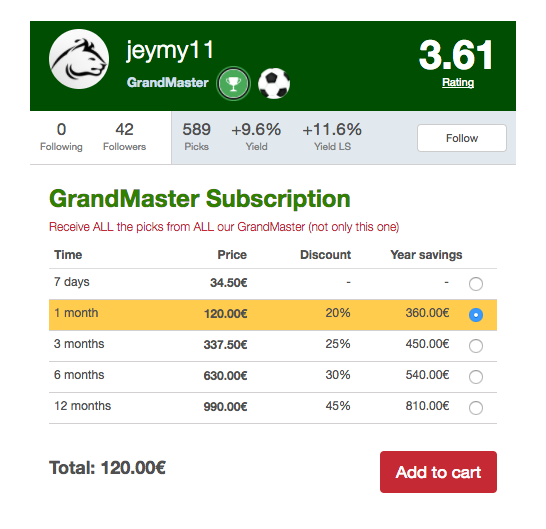 The GrandMaster subscription gives you access to all the picks submitted by all the GrandMaster Tipsters. If you had thought about managing your own portfolio of Tipsters, this subscription is the right way to do it. 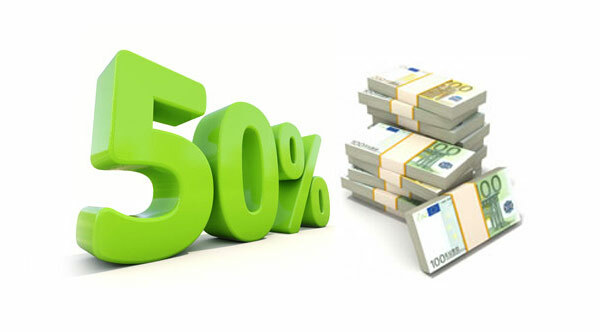 It’s a very interesting price, as you will have access to around 50 Tipsters. In your personal Timeline you will see the picks and comments of those Tipsters you follow. For every match there will be one page (The Match timeline) where you will see all picks and analyses made by Pyckio Tipsters. It’s the equivalent to the #hastag screen in Twitter. 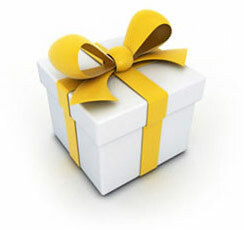 All registered users can participate in our contests and win great prizes! Copyright © Pyckio 2014-2018. All rights reserved.